Want to learn how to interview people as a journalist? Maybe you’re curious about the methods journalists use when interviewing people. Maybe you're a pro in need of a refresher course, with a few new thoughts thrown in. 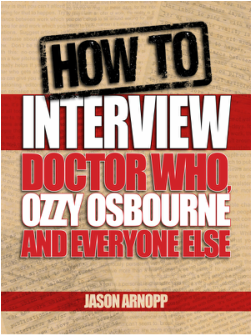 Either way, the acclaimed ebook How To Interview Doctor Who, Ozzy Osbourne And Everyone Else will be your guide! Drawing on 25 years of experience and with over 1000 interviews behind him, British journalist Jason Arnopp aims to tell you everything he knows about interrogating the great and good. While Arnopp has spent these decades interviewing celebrities and rock stars like OZZY OSBOURNE and Doctor Who star MATT SMITH for the likes of HEAT, DOCTOR WHO MAGAZINE, Q, SFX and KERRANG!, the vast majority of the principles described here will also apply to ANY journalistic interviewing task. You need this book in your toolbox! You can buy the ebook direct from the author, in a Triple Pack of files to suit everyone (PDF, Kindle/mobi and ePub). If you'd like the Triple Pack for £6.66 - exactly the same as the Amazon price - please head to my Payhip store to pay with PayPal. You can use various credit cards, easily and quickly. You don't even need to be a PayPal member. The Triple Pack will auto-emailed to your PayPal-registered email address. Buy it for Kindle through various Amazon sites around the world. The Kindle Edition will play on Kindles (surprisingly enough), iPads, iPhones, Android, PC and Blackberry, thanks to Amazon's Free Kindle Apps. Scott Matthewman (former Online Editor and Digital Project Manager, The Stage - his five-star review of the book can be read here). Phil Alexander (Mojo Editor-In-Chief and former Kerrang! Editor). Paul Rees (Q Editor and former Kerrang! Editor).